1. Make the crust: In a large bowl, whisk the flour, sugar, and salt together. Scatter pieces of cold butter on top and cut in with a pastry cutter until the largest pieces are the size of peas and the mixture looks crumbly. Working quickly, drip the egg into the dough and toss with a fork until the dough sticks together when pinched. If the dough is too dry, add a tablespoon of ice water. Turn out onto a lightly floured surface and knead a few times to incorporate the dry ingredients. 2. Butter or spray a 10-inch tart pan. Lightly press the dough into the tart pan. The dough should cover all the sides but not lose its crumbly texture (if you work it too much the pieces of butter will melt). Place the tart pan in the freezer for 30 minutes. 3. Peel, halve, and core the pears (take care not to break the pear halves while coring). Bring the water and 1 cup of sugar to a boil in a large saucepan and stir until the sugar is dissolved. Scrape the vanilla seeds from 1/2 of a vanilla bean into the water and put the pod in as well, or just add the teaspoon of vanilla extract and stir to combine. Gently place the pears in the water (I lowered them into the water with a slotted spoon), lower the heat, and cook at a low boil until the pears are just tender when pierced with a fork (but not mushy), around 10-15 minutes. Carefully remove the pears with a slotted spoon and set aside. 4. Whisk the egg, egg yolk, and vanilla lightly in a medium-sized bowl. In a double boiler (or a bowl set over simmering) melt the chocolate with the cream, stirring and folding with a heat-proof spatula to combine into a smooth and shiny ganache. Stir in the 1/4 cup sugar and cook a few minutes more, until the sugar has melted. Set aside to cool. 5. Remove the tart dough from the freezer and preheat the oven to 375F. Carefully transfer your pear halves to a cutting board and, holding each pear with one hand to keep it intact, carefully slice into thin slices. To fan out the pear slices, press the wide end of the pear gently towards the narrow end. 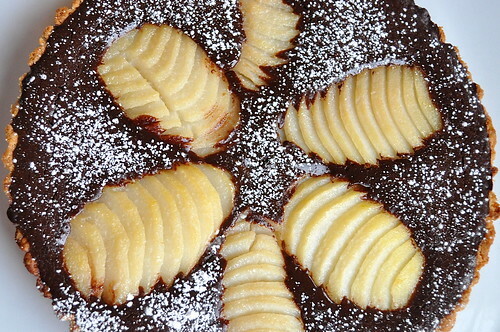 Slide the knife under the fanned pears and arrange them in a circle inside the tart pan. 6. To make the custard, slowly dribble about 1/2 cup of the chocolate mixture into the eggs, whisking constantly. This warms the eggs, preventing them from cooking. 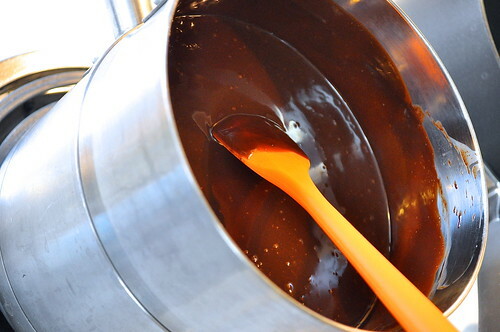 Add the rest of the chocolate in a steady stream and stir to combine. 7. 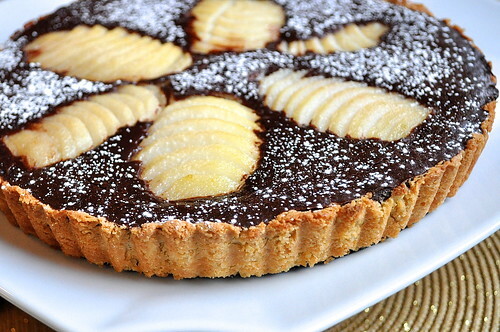 Pour the chocolate mixture into the tart pan, pouring as much as possible around the pears rather than on top of the pears. (I had a bit of custard leftover that I added to a ramekin to bake separately). Bake for 45-55 minutes or until the chocolate custard is puffed and set (it will be firm to the touch and slightly cracked around the edges). Cool on a wire rack for 10 minutes. 8. 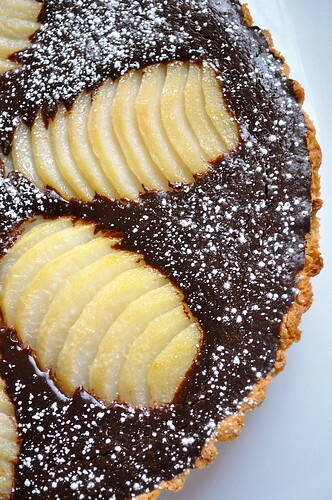 Remove the tart from the tart pan and slide onto a plate or platter. If desired, brush the pears with a little bit of melted apricot jam/apple jelly to glaze and then sprinkle with powdered sugar before serving. Serve warm or at room temperature. 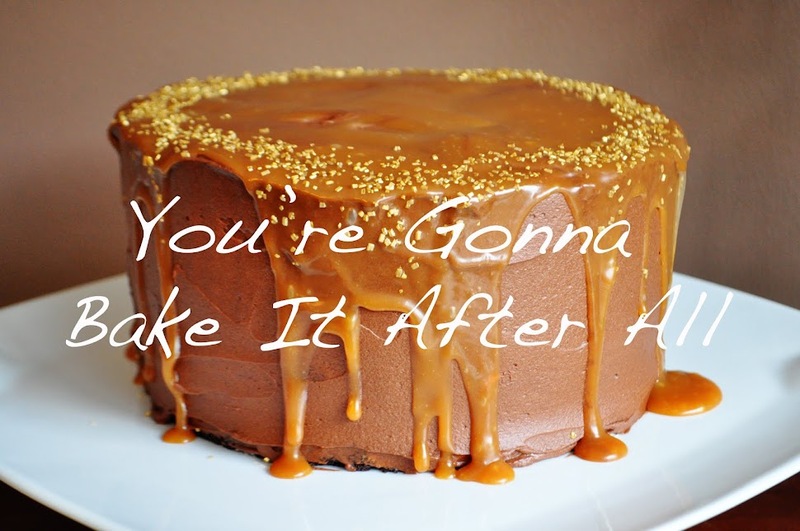 Optional: Serve with lightly-sweetened whipped cream. This was delicious. Can't wait for Meghan to make it again. Fruits and chocolates nothing beats the combo. Tossed in my hearts day baking list. :) Got my eye on your next posts.